Bulk wood pellets are delivered throughout New England (and beyond) using several different methods. 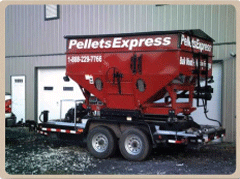 Typically, pellets are blown through a hose and metered as they come off the truck. At this time, bulk delivery is a specialty service offered by a select number of qualified and capable distributors. However, WoodPellets.com no longer provides this service. 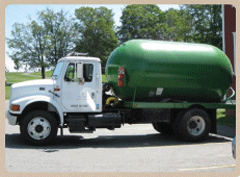 This Next Generation European-style pressurized tank truck is owned by Maine Energy Systems in Bethel, ME. 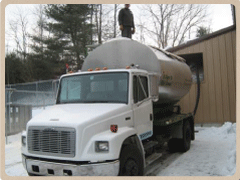 They deliver bulk wood pellets in Bangor, Bethel/Rumford/South Paris, Lewiston/Auburn, Mid-coast, and Portland areas. This bulk delivery truck is owned by Vermont Renewable Fuels, which delivers bulk wood pellets out of distribution centers in Dorset and Pownal, VT.
Bob Garrett, owner of BBAF of Vermont, uses this innovative, converted propane tank truck to deliver in and around Barre, VT. Call 802-233-1549 for more information. 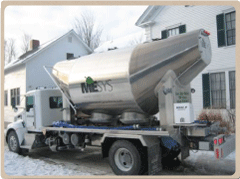 This bulk delivery truck is owned by Morton Bailey of Lyme Green Heat in Lyme, NH. Energex Wood Pellet, a manufacturer in Mifflintown, PA, rents this bulk pellet trailer to several of its local retail customers. The Sandri Companies in Greenfield, MA, uses this bulk trailer to delivery to institutional and commercial customers in Massachusetts and beyond. Sandri also has a smaller residential delivery truck.